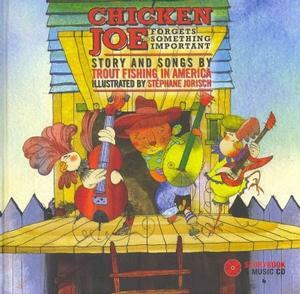 Chicken Joe is back in the delightful new storybook-music CD, Chicken Joe Forgets Something Important. Chicken Joe, is caught up in a new adventure. This time, Chicken Joe awakens to realize that he's forgotten something kind of important. But, what could it be? Chicken Joe sets off to solve this mystery. Along the way he meets up with various friends who are planning something memorable, but are keeping this inside secret from their good friend—it's a big happy birthday to Chicken Joe! What he doesn't know is that his friends have planned a big surprise birthday party in his honor. Come and celebrate with Chicken Joe and some of his good friends. This entertaining title is packed with twelve new songs on the supplemental CD, sung by Trout Fishing in America. Dance to fun tracks like, "16 or 17 Hours of Sleep" and "C-A-T in the H-E-N House". Also, check out our earlier title, My Name is Chicken Joe, also written and performed by Trout Fishing in America. There is nothing I can say that is wrong with this book/CD combo, it is an excellent addition to any library. The music is wonderful, the story is delightful and the illustrations by Stephanie Jorisch are just a perfect blend of colour and magic. I loved how all of Chicken Joe's worked to make a memorable day for Chicken Joe. The thought of a cat named Chicken Joe who lives in a hen house is hilarious and then there's the dog named, "Miss Kitty". The whole premise of the characters are charming, the story has purpose with wondrous results and a happy ending is to be found by all. I loved the music on the CD, it's kind of a rock'n'roll folk sound that keeps your toes a'tappin' and your fingers a'snappin'. My kids and I boogied around the room on a few of the more happening tunes, like "Rock'n'Roll Roosters" and "You've Got A Funny Name", which has a country twang to the tune. My kids said to tell everyone to go and get this for their collection, it is a great book with awesome music. I would give Chicken Joe Forgets Something Important a five out of five stars. It is original in content and has many hilarious antics and songs. My children love it and it has been played numerous times over! With six thumbs up, how can you go wrong?? Chicken Joe, oddly enough a cat who sleeps in the hen house, is abruptly awoken one morning by roosters playing rock ‘n’ roll. Somehow he’s forgotten that it’s not just a day like any other; it’s his birthday! Making his way to the farmhouse for breakfast, Chicken Joe meets up with his friends, all of whom would rather joke around than remind the cat that today’s his birthday. After all, they've planned a surprise party for their buddy. The chickens Helen and Hilda have baked a cake; Miss Kitty, the little dog from the city, has made a fish piñata; and the mule, Mister, has gathered up some funny hats and noisy kazoos. Will Chicken Joe finally remember that today’s a very special day, or will his friends have to tell him? In addition to narrating their story, the internationally renowned Trout Fishing in America performs 11 songs on the accompanying CD. Their witty, engaging lyrics—demonstrated on “Rock and Roll Roosters,” “Me to Know and You to Find Out,” “C-A-T in the H-E-N House,” and “You’ve Got a Funny Name”—and splendid musicianship combine several musical styles including rock, country, folk, pop, and blues.